I hope that with my topic on ISP's and their importance and market value in the tech world. I will aslo talk about other important and upcoming events, facts and current situations that deal with Internet Service Providers. I will talk about the history of them and how they have come to be a major role in the tech world and how they service their brands to potential customers. An Internet Service Provider is a company that provides access to the Internet to customers. With the growth of competition among companies it has allowed advances in customer experience and faster broadband.Each company pputs seperate packages for customers with different needs, the higher the price, the faster the service. An ISP is the gateway for thier customers to reach the internet. Most people's service provider is given to them through their able package or "service-subscription". There are different kinds available doe public purchase, such as cable and DSL. Every device that runs through the companies package sends a request to the ISP to access the servers to download and upload different files, videos etc. There are different ISP companies that customers and other companies can choose from and are seperated into two different categories. The two are fiber and cable, cable optic broadband is better because it carries data faster and is connected to homes by coaxial cable in the last mile between the local exchange and the customer's home concsits of copper lines. Which are are far slower and the price packages would be lower compared to fiber optic broadband. The need for fiber optic cable has risen recently, a new stufy has shown that Verizon has recently sined a 1.1 billion dollar purchase agreement with Corning to buy 1.5 million miles of fiber for over three years. AT&T has also made an initiative to advance their company. At first the only allowance of the internet was the goverment and universities. Although the speeds were adequately slow from the use of dial-up was still rare, Over time consumers began to want internet service of their their own after two years of its creation and the NSF lifted the ban and allowed internet access to the public. The creation of small games such as Space Invaders and Pac-Man with integrated chat-rooms swept the nation. This created an even greater want for public internet access, which then brought about the next evolution of faster internet service. DSL(Digital Subscriber Line) was the first known broadband service when benefited urban subsribers because they were closer to the inner city. This eventually brought about competition for ISP's to provide customers with internet service, 20 years later they now offer fiber and cable optic lines for communications. Satelite is another way of service, it is not limited to cables, wires or populated areas. The speeds are signifcantly slower than cable and fiber but it is a good solution to those that cant aquire service due to location. DSL is steadily moving out of the market and more people are deciding to change to fiber for faster speeds. More companies like Verizon and Google Fiber released new packages in 2013 that service higher speeds. Semantic markup is the use of HTML to reinforce the information in webpages and web applications. It is the use of markup langauages like HTML to convey information about the meaning of each element in a document through proper markup elements. It is also to maintain a complete seperation between the markup and the and the visual representation between the two . Section 508 is an amendment in the United States Workforce Act of 1973, which is a federal law stating that all electronic and information tecnology that is maintaned by the goverment must be accessible to people with disabilities. What is deemed "accessible" is that it can be obtained just as easily was people without disabilities. SEO (Search Engine Optimization) is the practice of having a specific company or person tryine to gain higher search results to their own website. This can be done through advertising which can bring more traffic to a website. The overall goal is to get more organic results. Through AT&T's merger with Time Warner, this juggernaut has more share on the market than ever before. An additional merger was approved to gain Charter Communications cable with Time Warner which was led to create the largest broadband provider in the United States.This held about 70 percent of the total market value of internet connectivity. Other big companies such as Comcast was forced to cancel its bid for Time Warner Cable due to the FCC rejecting its appeal in 2015, believin it would almost create a monopoly. Other big events such as Verizon buying out AOL, which was at one time the largest service provider in America. Although it is on the decline because of its use of dial-up and the steady rise of broadband connectivity, it was purchased for 4.4 billion in 2015. As the internet steadily grows and advances there will be faster ways to connect through the internet, which in turn will always create a need and wnat for greater service. 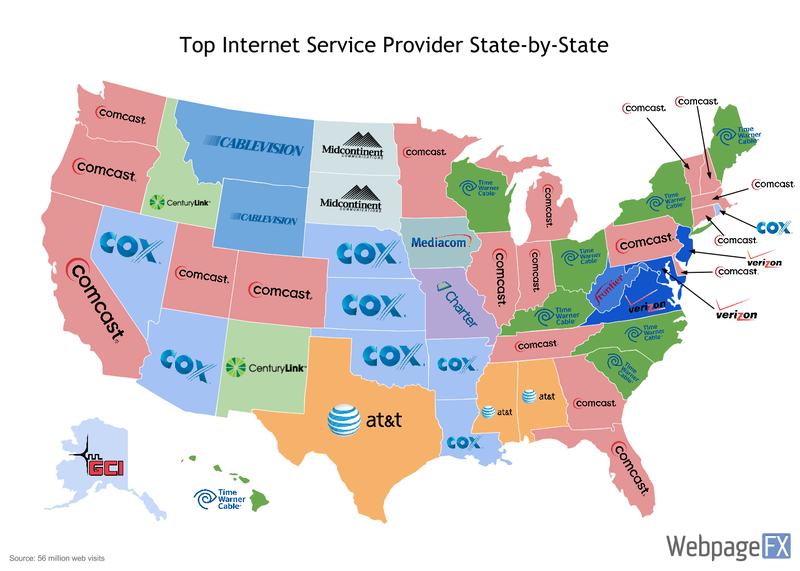 Although, many companies such as Comcast and Charter are still popular, other mobile service providers are growing stonger and bigger by the day. The traditional thought of one line ISP's are thinning out due to greater advancements in mobile connections. The deciding factor of when more customers will decide to choose one line or mobile if they can continue to maintain better speeds over its competitors.